Helpful Information About Sleep, Mattresses and Bedding Products. : 60 x 74 Short Queen Mattress - Where to Find ? 60 x 74 in the mattress world is called a short queen mattress. 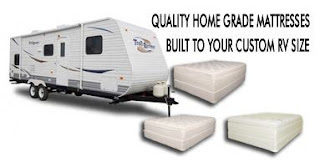 Short queen mattresses are a hard to find and are not offered at most mattress stores today. Typically used for for RV use, but also smaller rooms or cottages. Because of the small market low sales volume most local mattress and bedding stores tend not to even offer short queen mattresses as a purchase option. Because of the micro management required you might have to go to a online source to get a quality custom sized mattress like short queens. HERE ARE SOME GOOD BUYING TIPS. (1) Don't buy the cheapest mattress you can find. You regret it big time. A quick trip to your local RV supplier will revile some really low quality models that will lack comfort one would demand while on vacation. (2) If they don't tell you how thick it is, don't expect it to be thick. Many will take pictures of thicker versions to make the image of the mattress look better. 4 inch and 6 inch poly foam models will be very firm feeling and will feel much closer to a couch cushion on a wood deck. If you want your mattress to feel like your home grade mattress you will have to get one from actual home mattress manufacture. (3) Avoid RV and Camper suppliers. Go to direct to the source that specializes in mattresses. RV and Camper suppliers sell a vast amount of different products for RV industry but they just don't get it when it come to comfort. They tend to sell the lowest cost item that is not built for the long run. So in the end because the low quality they will only last a short amount of time and ends up costing more after factoring in quick replacement. Here is a 8 inch firm model build on a bonnell innerspring with foam. Prices $ 399.00 with Free Shipping.